A workplace pension is a way of saving for retirement arranged through an employer. It is sometimes called a company pension, an occupational pension or a works pension. New pension laws mean every employer must automatically enrol their staff - subject to qualifying criteria - into a workplace pensions scheme and make mandatory contributions to their employee's Pension. Click here to see if your employees will need to be automatically enrolled. State Pensions are becoming unsustainable and this situation will only worsen as people live longer. Employers and employees will share the responsibility and cost of retirement. When will these changes affect me? It's important for employers to be aware of the deadline when automatic enrolment will impact them, known as the ‘staging date'. The requirements are staged over time, the largest corporations started auto enrolment in October 2012 and the very smallest employers will all become subject to these changes by April 2017. Companies with less than 50 staff must implement the scheme from April 2015 at the earliest and those with 30 staff or less by October 2015, depending on their individual staging date which is determined by their PAYE Reference number. Click here to find out your own staging date based on your PAYE reference number. Businesses should plan well ahead of their staging date, amendments in areas like payroll, human resources and IT will need to be considered. The average time to prepare for implementation of a qualifying pension scheme is c.18 months and therefore all businesses are recommended to start preparations as soon as possible. This criteria applies even for those business owners that employ their spouse. Those workers who aren't eligible to be automatically enrolled may be able to opt-in and equally, some staff will elect to opt-out of saving for retirement in this way. If an Employee does opt out it is the employer's responsibility to ensure that they are automatically enrolled back into the scheme every 3 years. Employers must inform The Pension Regulator of their qualifying workplace pension scheme within five months of the employers staging date. Registration must be completed within five months of the employer's staging date and will have to be updated every three years thereafter. The Pension Regulator will have the ability to impose penalty notices if an employer does not comply with their new duties. A fixed penalty notice will be issued if you don't comply with statutory notices, or if there's sufficient evidence of a breach of the law. This is fixed at £400 and payable within a specific period. An escalating penalty notice for failure to comply with a statutory notice. This penalty has a prescribed daily rate of £50 to £10,000 depending on the number of staff you have. A civil penalty for cases where you fail to pay contributions due. This is a financial penalty of up to £5,000 for individuals and up to £50,000 for organisations. Where employers fail to comply with a compliance notice or there is evidence of a breach, a prohibited recruitment conduct penalty notice can be issued. This penalty has a prescribed rate of £1,000 to £5,000 depending on the number of staff the employer has. As an employer you have workplace pensions duties which mean you will need to automatically enrol certain staff into a pension scheme and make contributions to it. You must assess staff, put those you need to into a pension scheme, and tell them about automatic enrolment. You should start planning for automatic enrolment 12 months before your staging date. This the date your duties come into effect. The Pensions Regulator (TPR) is tasked with ensuring employers comply with their duties. You must complete a Declaration of Compliance and submit it to TPR. Completing the declaration shows TPR what you have done to meet your duties. Who needs to complete a Declaration of Compliance? All employers with one or more staff have a legal requirement to complete a Declaration of Compliance. Even if you do not have any staff to put into a pension, you must complete the declaration to confirm that you have met your duties. When does it need to be completed by? Each employer has a declaration of compliance deadline which falls five months after their staging date. The declaration of compliance needs to be completed and submitted to TPR by this deadline. Although you have five months to complete your declaration, we recommend you start completing it as soon as possible after your staging date. Filling in details as you go through the automatic enrolment process will help you avoid missing your deadline. What if I've used postponement? If you have used postponement you cannot complete your declaration of compliance until after the postponement period has ended. However don't leave filling in the details until then as there may be very little time between the end of the postponement period and the declaration deadline. It's a good idea to fill in the details as you get them so that you do not risk running out of time. Can a business adviser do this for me? If you choose to ask someone else to complete the declaration on your behalf, for example your business adviser, it remains your responsibility as the employer to ensure the declaration is completed on time and the information provided to us is correct. If not, you risk a fine. So, make sure you know who is completing the declaration of compliance and that the information is correct. What if I don't complete the declaration on time? Failure to complete your declaration on time could lead to a fine. How can I access the Declaration of Compliance? The declaration is a secure, online form. You need a Government Gateway ID to access this. If you haven't already got an ID, you will be given instructions when you start the declaration process. What information do I need to complete it? If you have all the relevant information to hand it can take as little as 15 minutes to complete your declaration. How much will the employer and employee have to contribute? Employer and employee contributions will be tiered and will increase gradually over a 2 year period. Minimum Employer and Employee contributions are calculated based on the employee's Banded Earnings: £5,824p.a - £42,365 p.a (2015/2016). See below the minimum contributions applicable to all gross earnings (within the band) including wages, salary, bonus, overtime, commission, statutory sick and maternity pay and when they come into effect. Employees benefit from tax relief upon their contributions. Remember, employer contributions are part of an employee's benefits package, they needn't be an additional burden upon your business and early implementation as part of annual reviews can help your business accommodate these gradual cost increases. 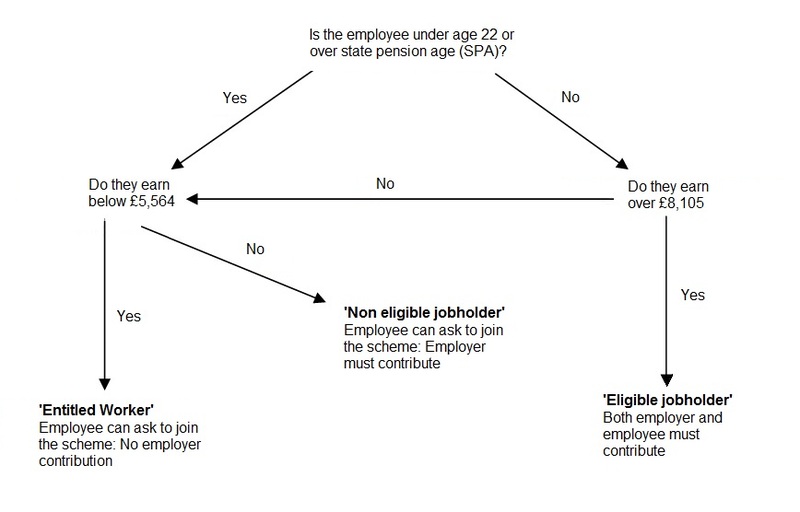 When can employees access their pension fund? The scheme has been set up specifically to encourage everyone to save for their retirement. For this reason any money paid into your pension cannot be accessed until your 55th birthday. Once you retire you'll be able to draw 25% of your pension pot as a tax free lump sum. While 25 per cent of the fund can be taken as a tax-free lump sum, anything above that amount will be treated as income and taxed accordingly. So if a withdrawal takes an individual into the higher rate tax bracket in that year, 40 per cent tax will be payable. And once moved out of the pension, it will no longer be able to grow tax-free if ISA allowances have been used up. From March 27, 2014 anyone with total pension assets of £30,000 or less will be able to take their fund as cash, compared to a limit of £18,000 previously. And anyone with more than £30,000 pension savings but who has a separate pot with up to £10,000 in it will also be able to take that smaller pot as cash. Previously, only small pots up to £2,000 could be taken as cash. Can an Employee choose to opt out? Yes, Employees can choose to opt out of the auto enrolment process however, it is the Employer's responsibility to ensure that they are automatically enrolled back into the scheme every 3 years. ActSmart can offer all businesses, no matter what size, advice on pension auto-enrolment. Call us on 01273 427 700 for more information. Every business should also ensure they are part of the ActSmart community to be kept up to date with all changes related to Pension auto-enrolment. You can join for free by clicking below. For further information please visit: http://www.dwp.gov.uk/policy/pensions-reform/workplace-pension-reforms/.